It’s interesting how much I learn from teaching. Over the past year or so, I have had four or five students rise quickly to the “uh-oh this is serious!” level of intensity with their cello practice and approach to playing. It looks like a few of them are even going to take it to the next level with music school. You know that I specialize in adults, right? One student came to me last year, a retired scientist, with a head full of clutter and a high level of ability. We’ve gone through a bunch of repertoire, and in the winter, she started taking music classes down at the local community college. She’s been taking harmony, theory, musicianship, orchestra, and then intensive lessons with me, so I started calling her “The Music Major”, because that’s the life of a college musician. (note the lack of GE courses) She even walked into the rehearsal hall and sort of stumbled into a professional group and ended up performing Bartok Concerto for Orchestra and Hary Janos Suite in their concert! When I told my “music major” about J’s plan, she immediately began percolating with thoughts of the university environment, herself. Now I’m researching places for both of them and bumping up their orchestral excerpt practice, plus I have a high schooler who is going to be attending Idyllwild this summer, and I’m loading him down with lots of sight-reading, Popper, and Elgar. Exciting times in the studio of Emily Wright, eh? Well, I suppose. The students who stick around provide much intrigue and satisfaction for me. But the Summertime Student Drop Off (surely the subject of a future Glossary entry) has already commenced, and it’s about this time of year that I start looking around saying, “What am I going to do ?” If I hadn’t been such an Emily, I would be playing in an orchestra or two around town. But since I’m Me, I keep looking to take some responsibility for the hostile environment the Los Angeles classical performance scene has now become. What’s most compelling to me is that the people who pull the strings (ooh! pun! ouch!) don’t even really know me. I’m just a loudmouth with a blog. But you know how musicians are. Or maybe you don’t. Well, for the record, many of the people charged with eliciting the most sensitive, subtle shadings of musical expression are prone to fits of jealousy and vapors unlike anything you have ever seen. If you are a pro, are reading this, and just laughed at that last sentence, you’re not one of them. If you’re all ticked off, well, you might want to give it a thought, making sure you have a sofa close by to catch your fall. I was watching the HBO documentary about Frazier/Ali and the famous Thrilla in Manila, and was reminded of the frailty of even the most allegedly powerful people. I was sitting next to a friend’s mother, who kept asserting that Muhammad Ali was evil for saying all of those hateful, horrible things about Joe Frazier. Ali incited such a divide among an already uneasy American populace, and deeply hurt Frazier, who had helped reinstate Ali after he was punished for being a conscientious objector to the Vietnam draft. So for weeks before the fight, Ali turned up the knob on his rhetoric, calling Joe everything from an Uncle Tom to a gorilla. It made my stomach turn to watch the press conference more than the fight itself, which left both men bruised, disfigured, and ruined. I don’t think so. I think he was fragile. Paper-thin. Unable to cope with a fair fight with the very man who was so decent to him a few short years before, he wanted to destroy him. He wanted to destroy the greatness in him. And in the end, he did. 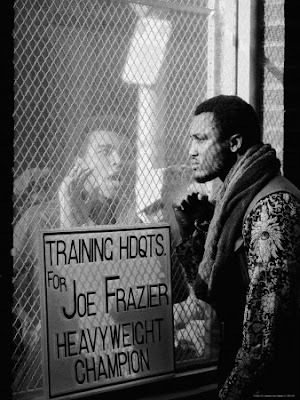 Joe Frazier can’t forgive Ali, even now. He gloats a little as Ali shakes, claiming that it is justice. In the battle: Emily VS the power players of the LA music scene, I don’t want to be Frazier or Ali. In fact, I don’t want to be a boxer at all. Certainly not in this ring. Sooner or later here, we all end up ruined. Replaced by the next guy who is now in favor with so-and-so, or by the woman who slept with you-know-who. I refuse to be ruined like Frazier, holding on to hostility for the other guy. I have too much to be thankful for to keep questioning whether I should have played along, or allowed myself to be hit on, or bent myself into a more pleasing shape for the benefit of my career here. I would not permit such a waste of time by my students, and I owe them (and you) so much for reminding me of that. I want to teach, I want to play, I’m good at both, and it’s just about finding a place where I can do them. For all of us, at every level, it is truly Never Too Late. Overheard my chamber music teacher telling the other staff at the jury (I was standing near the door) that even though I played violin, viola and a decent guitar, the cello was probably going to be my best instrument. A nice back handed compliment. Great post Ms. Emily – you have brightened my day! Sounds like there should be a chapter in your book titled: “Music Industry Ethics” or “Maintaining QI Without Dropping Your Drawers or Your Cello”. Actually, depending on how I feel about my experience with BookSurge, I may compile my blogs into a book, with that kind of stuff very much included. There will even be a section for “best comments”, so who knows? Maybe our favorite risk management/assessor/former military/don’t mess with this guy cellist will be in it!